Researchers Ellen Martinsen and Joseph Schall discover that malaria is widespread, affecting between 18 and 25 percent of the deer population on the east coast of America. Two years ago, Ellen Martinsen was collecting mosquitoes at the Smithsonian’s National Zoo, looking for malaria that might infect birds—when she discovered something strange: a DNA profile, from parasites in the mosquitoes, that she couldn’t identify. By chance, she had discovered a malaria parasite, Plasmodium odocoilei—that infects white-tailed deer. It’s the first-ever malaria parasite known to live in a deer species and the only native malaria parasite found in any mammal in North or South America. Though white-tailed deer diseases have been heavily studied—scientists hadn’t noticed that many have malaria parasites. Martinsen and her colleagues estimate that the parasite infects up to twenty-five percent of white-tailed deer along the East Coast of the United States. Their results were published Feb. 5, 2016, in Science Advances. The new study, led by Martinsen, was a collaboration with scientists at the Smithsonian Conservation Biology Institute, the American Museum of Natural History, the National Park Service, the University of Georgia, the University of Wisconsin-Milwaukee—and UVM biologist and malaria expert Joseph Schall. Though Martinsen and Schall are quick to note that they anticipate little danger to people from this newly discovered deer malaria, it does underline the fact that many human health concerns are connected to wider ecological systems—and that understanding the biology of other species is a foundation to both conservation and public health management. In 1967, a renowned malaria researcher reported he’d discovered malaria in a single deer in Texas. But the received understanding was that “malaria wasn’t supposed to be in mammals in the New World,” said Schall, who has studied malaria for decades. “It was like the guy was reporting he saw Big Foot,” and no other discoveries were made after that. But now Martinsen and her colleagues have discovered that the deer malaria is widespread—though it’s “cryptic” she said, because the parasites occur in very low levels in many of the infected deer. “Ellen spent days and days looking through a microscope at slides that were mostly empty,” Schall said, but eventually found the parasites hiding among thousands of red blood cells. Combined with sensitive molecular PCR techniques to understand the genetics, the team confirmed a high prevalence of the disease—between 18 and 25 percent—in sites ranging from New York to West Virginia to Louisiana. The new discovery fundamentally changes our understanding of the distribution and evolutionary history of malaria parasites in mammals, Martinsen said. Some scientists wondered if the deer malaria could have jumped from people or zoo animals in the recent past. But the new study suggests otherwise. The team’s data shows that the deer actually carry two genetic lineages of the malaria parasites—“probably different species,” she said—and that the two lineages are substantially different from each other. Malaria is a major problem for people in many parts of the world—and for many species of wildlife too. It has been devastating bird species in Hawaii and Bermuda, among many epidemics. Whether it is hurting white-tailed deer in America is an open question. Martinsen suspects not, because she’d expect to see more obviously sick animals. But Schall wonders if, like some human malaria infections, the disease causes a low-level burden that hurts deer populations. They both agree that it is an area that calls for more research—and that the new study raises many other questions, including whether the parasite might infect dairy cows or other hoofed species. 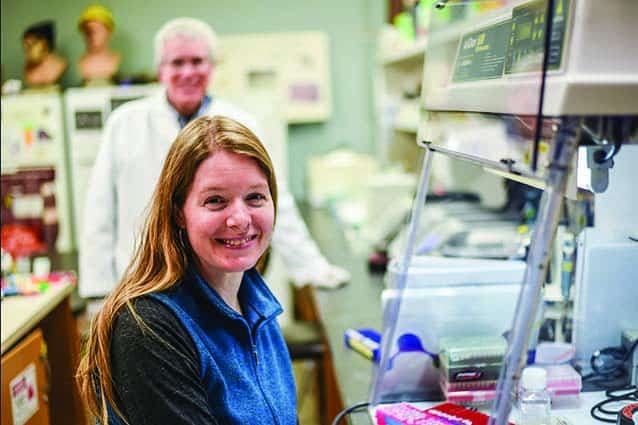 Ellen Martinsen completed her undergraduate and doctoral training at UVM in Joe Schall’s lab and went on to do her postdoctoral research at the Smithsonian Conservation Biology Institute’s Center for Conservation Genetics. The new discovery drew on a team of scientists and veterinarians at the Smithsonian and other institutions, who studied samples from both live and necropsied deer as well as mosquitoes. Additionally, Martinsen returned to Schall’s lab for some of the new research.